The Japanese car manufacturer Datsun commenced car production by assembling Austin cars under licence. The Datsun 1000 was nothing more than an A40 with a body redesign. Datsun first entered the USA sportscar market in the mid-1960s with the 1600 Sports as well as 2.0-litre models but their entrants were very conventional and soon became dated. In the market place their robust but basic engines and stark two-seater styling failed to capture the hearts of the American motorist. 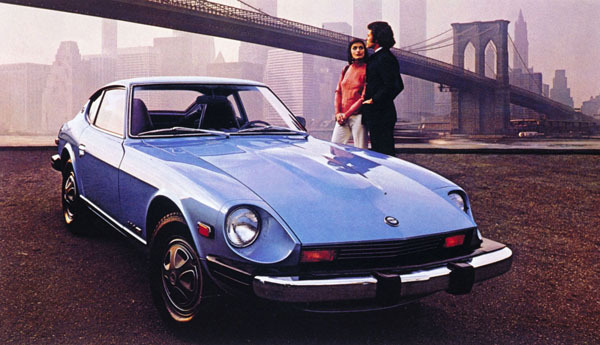 The company realised, however, that the American market offered enormous potential and as a result they developed a new model, the 240Z, specifically for this market. This car was unable to compete with other strong sellers in the performance stakes such as the Jaguar E-type or Italian exotica but it was a much more modern car than the MGB or the Triumph TR6 and the 240Z soon took over market leadership. In so far as general layout was concerned, except for its independent rear suspension, the 240Z was something of a classic design. It was even compared with the Austin-Healey 3000 perhaps as a throwback to Datsuns early licence links with Austin. It had a front mounted engine of 2393cc coupled to a rear wheel drive; the engine being an in-line overhead cam six which was already used in some other Datsun passenger cars. The USA market loved it, and even more so its relatively low showroom price. The car itself was fairly conventional for a two-seater with a unit construction steel body, Macpherson strut independent front suspension, with rack and pinion steering and large front wheel disc brakes. A softer ride was obtained by the use of independent rear suspension incorporating Macpherson struts and lower wishbones. Some models used 2 litre engines instead of the 2.4 litre engine, but the bulk of production comprised what came to be affectionately known as 240Z Z-Cars. Some wags even dubbed them the 24 Ounce car! The original car continued in production until 1973 by which time in excess of 156,000 Z cars had been produced.